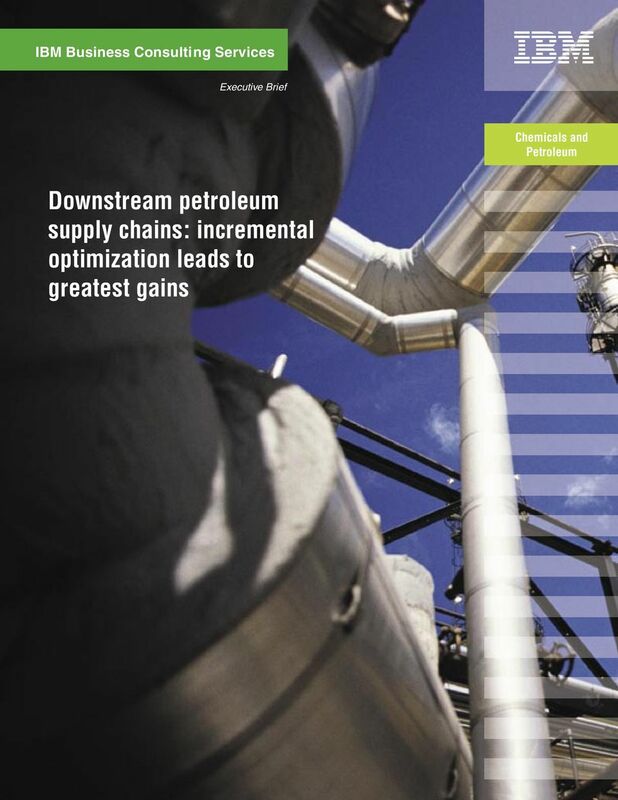 Download "Downstream petroleum supply chains: incremental optimization leads to greatest gains"
3 Companies within the downstream petroleum industry want to grow revenue and market share while reducing costs. They face thin margins that limit capital spending for growth initiatives. Efforts to drive down costs through lineitem cutting have been effective, but many companies are finding that there are fewer and fewer options remaining. Still, merger and acquisition activities remain common, and most companies want to standardize their processes and operate globally. These goals and challenges are no different from those in most other industries. What is different, from a supply chain perspective, is the downstream petroleum industry s reliance on a volatile raw material, crude, coupled with a production and distribution environment that cannot respond immediately to changing demand for product. Typically, companies that have recently undergone merger and acquisition activity choose to operate duplicate, suboptimal supply chains that are not demand-based. Often, companies have inaccurate information about how these supply chains operate. Yet, in the face of worldwide uncertainty about volatile crude oil supply and the availability of refined product and prices, downstream petroleum companies need to make fast, well-informed supply decisions. 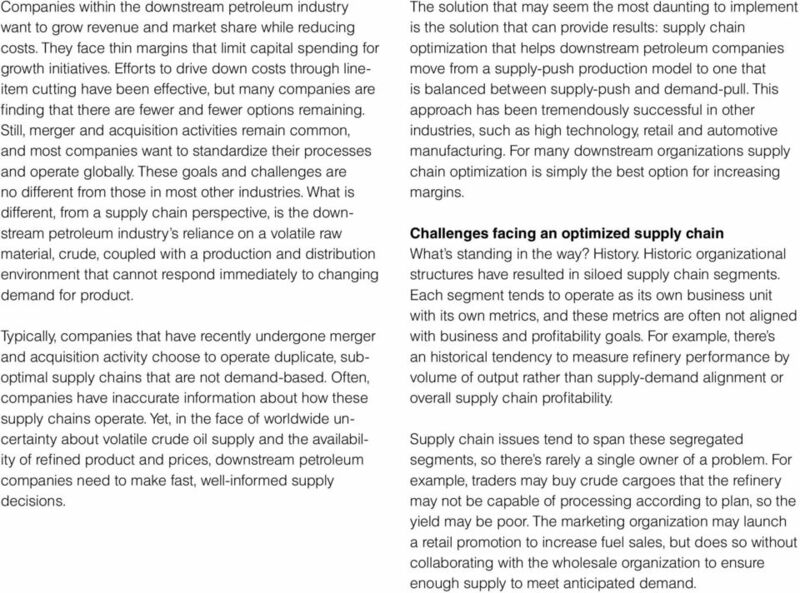 The solution that may seem the most daunting to implement is the solution that can provide results: supply chain optimization that helps downstream petroleum companies move from a supply-push production model to one that is balanced between supply-push and demand-pull. This approach has been tremendously successful in other industries, such as high technology, retail and automotive manufacturing. For many downstream organizations supply chain optimization is simply the best option for increasing margins. Challenges facing an optimized supply chain What s standing in the way? History. Historic organizational structures have resulted in siloed supply chain segments. Each segment tends to operate as its own business unit with its own metrics, and these metrics are often not aligned with business and profitability goals. For example, there s an historical tendency to measure refinery performance by volume of output rather than supply-demand alignment or overall supply chain profitability. Supply chain issues tend to span these segregated segments, so there s rarely a single owner of a problem. For example, traders may buy crude cargoes that the refinery may not be capable of processing according to plan, so the yield may be poor. The marketing organization may launch a retail promotion to increase fuel sales, but does so without collaborating with the wholesale organization to ensure enough supply to meet anticipated demand. 4 Without the right tools and processes, it s nearly impossible to generate a supply chain plan to achieve optimal results for the exceptionally complex problems of demand forecasting, supply/demand balancing, inventory targets and transportation planning. Many companies focus instead on simply what s feasible the fi rst solution found that will work. The solution may surprise you Many downstream petroleum stakeholders believe that creating a demand-pull supply chain is the secret to supply chain optimization. IBM doesn t believe that s true. Full supply-push can lead to either too little or excess inventory because refi neries are limited in production swing cuts. And regardless of marketplace demand, refi nery chemistry makes full demand-pull impossible. Balancing supplypush with demand-pull can help downstream petroleum companies to become more responsive to market demand within the constraints of this unique industry. In most marketplaces, becoming an On Demand Business an enterprise that can respond quickly to marketplace shifts typically requires a pure demand-pull model. 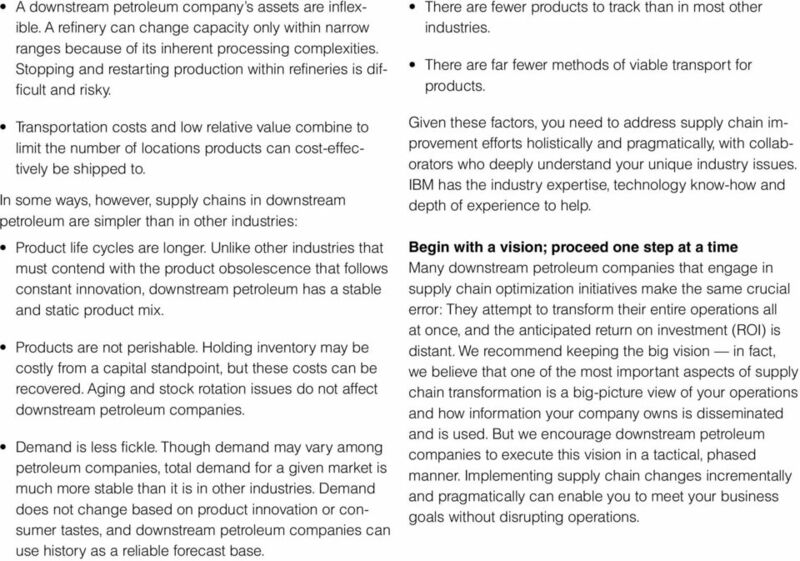 However, because the downstream petroleum industry simply cannot change refi nery operations as extensively or as quickly as needed, IBM believes that the best and most pragmatic approach is one of balance between supply-push and demand-pull. 5 Within that balance, companies still must cut costs. But the days of line-item cost cutting are over. Line-item costcutting efforts in terms of people, capital and inventory levels have weakened downstream petroleum companies. Valuable knowledge has been lost, and flexibility has been hamstrung. Instead of focusing on cutting costs, the focus needs to be on getting accurate information to the right people, quickly. In both the near- and long-term, building the right processes intelligently intertwined with the right infrastructure can enable cost cutting in a manner that promotes the financial health of the company. What s more, the right processes and infrastructure can help enhance revenue, ease compliance initiatives, and increase safety and customer loyalty. Start by recognizing how downstream petroleum is different from other industries Supply chain solutions that work well in other industries must be modified for downstream petroleum. This industry presents complexities not present in others: The inventory is commodity-based and fungible. Competitors within the same part of the supply chain can, and do, trade with each other. Associated financial markets for both crude and refined products play a large part in how supply chains are managed, and these markets can be exceptionally volatile. Companies supply chains are often discontinuous. Because inventory is a commodity, any given molecule is often traded several times or resold before it is consumed. 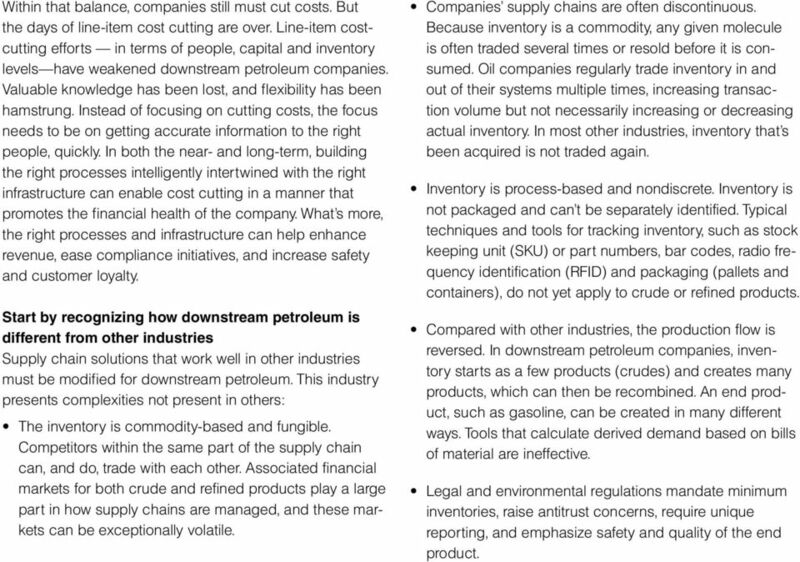 Oil companies regularly trade inventory in and out of their systems multiple times, increasing transaction volume but not necessarily increasing or decreasing actual inventory. In most other industries, inventory that s been acquired is not traded again. Inventory is process-based and nondiscrete. Inventory is not packaged and can t be separately identified. Typical techniques and tools for tracking inventory, such as stock keeping unit (SKU) or part numbers, bar codes, radio frequency identification (RFID) and packaging (pallets and containers), do not yet apply to crude or refined products. Compared with other industries, the production flow is reversed. In downstream petroleum companies, inventory starts as a few products (crudes) and creates many products, which can then be recombined. An end product, such as gasoline, can be created in many different ways. Tools that calculate derived demand based on bills of material are ineffective. Legal and environmental regulations mandate minimum inventories, raise antitrust concerns, require unique reporting, and emphasize safety and quality of the end product. 6 A downstream petroleum company s assets are inflexible. A refinery can change capacity only within narrow ranges because of its inherent processing complexities. Stopping and restarting production within refineries is difficult and risky. Transportation costs and low relative value combine to limit the number of locations products can cost-effectively be shipped to. In some ways, however, supply chains in downstream petroleum are simpler than in other industries: Product life cycles are longer. Unlike other industries that must contend with the product obsolescence that follows constant innovation, downstream petroleum has a stable and static product mix. Products are not perishable. Holding inventory may be costly from a capital standpoint, but these costs can be recovered. Aging and stock rotation issues do not affect downstream petroleum companies. Demand is less fickle. Though demand may vary among petroleum companies, total demand for a given market is much more stable than it is in other industries. Demand does not change based on product innovation or consumer tastes, and downstream petroleum companies can use history as a reliable forecast base. There are fewer products to track than in most other industries. There are far fewer methods of viable transport for products. Given these factors, you need to address supply chain improvement efforts holistically and pragmatically, with collaborators who deeply understand your unique industry issues. IBM has the industry expertise, technology know-how and depth of experience to help. Begin with a vision; proceed one step at a time Many downstream petroleum companies that engage in supply chain optimization initiatives make the same crucial error: They attempt to transform their entire operations all at once, and the anticipated return on investment (ROI) is distant. We recommend keeping the big vision in fact, we believe that one of the most important aspects of supply chain transformation is a big-picture view of your operations and how information your company owns is disseminated and is used. But we encourage downstream petroleum companies to execute this vision in a tactical, phased manner. Implementing supply chain changes incrementally and pragmatically can enable you to meet your business goals without disrupting operations. 7 Service-oriented architecture and Component Business Modeling A service-oriented architecture (SOA) is an application framework that enables you to break down applications into individual business functions that can be combined and recombined to support different activities. IBM Component Business Model methodology helps you to clearly see business process components that exist within your business, as well as the people, processes and technologies that support them. Together, these techniques provide a new, better way of looking at supply chain optimization. SOA and Component Business Modeling (CBM) are essential to the process of optimizing supply chains. 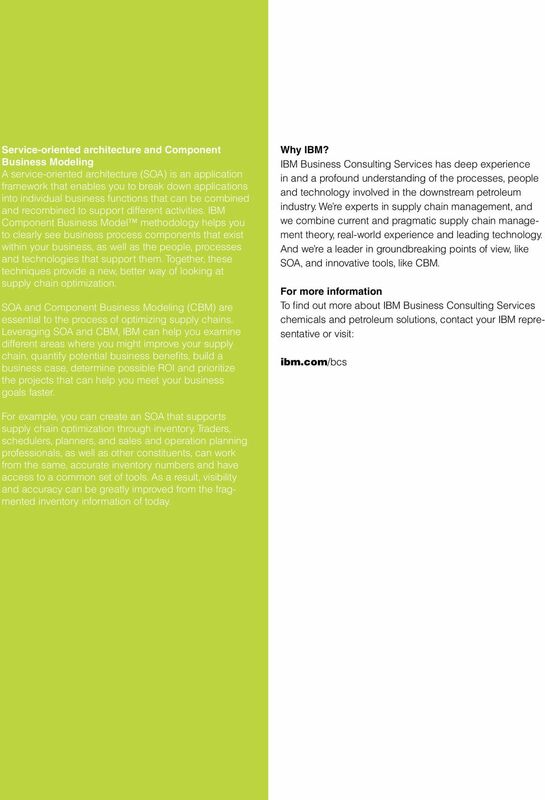 Leveraging SOA and CBM, IBM can help you examine different areas where you might improve your supply chain, quantify potential business benefits, build a business case, determine possible ROI and prioritize the projects that can help you meet your business goals faster. Why IBM? IBM Business Consulting Services has deep experience in and a profound understanding of the processes, people and technology involved in the downstream petroleum industry. We re experts in supply chain management, and we combine current and pragmatic supply chain management theory, real-world experience and leading technology. And we re a leader in groundbreaking points of view, like SOA, and innovative tools, like CBM. 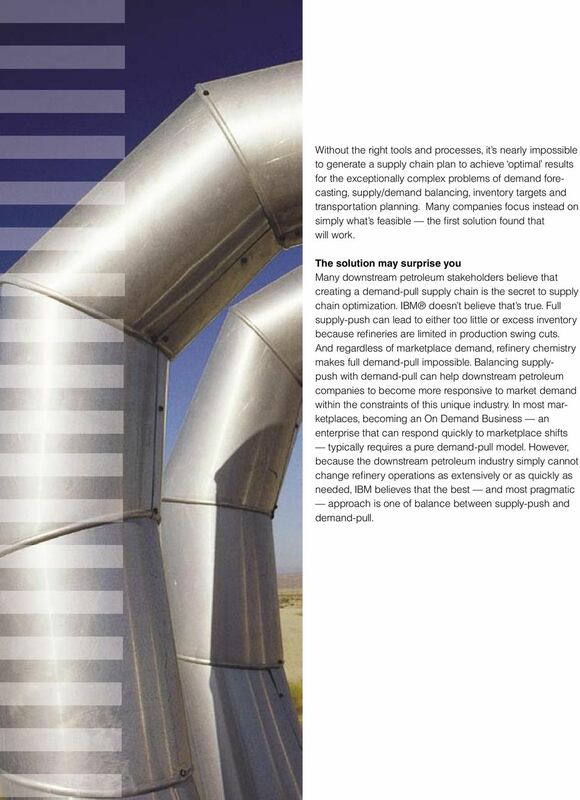 For more information To find out more about IBM Business Consulting Services chemicals and petroleum solutions, contact your IBM representative or visit: ibm.com/bcs For example, you can create an SOA that supports supply chain optimization through inventory. Traders, schedulers, planners, and sales and operation planning professionals, as well as other constituents, can work from the same, accurate inventory numbers and have access to a common set of tools. As a result, visibility and accuracy can be greatly improved from the fragmented inventory information of today. IBM Lender Business Process Services Charting a course for faster, smoother mortgage origination. Supply chain software that fits your people, your processes, and your IT environment. Ten steps to better requirements management. Information technology infrastructure key to your business success.